Wash and chop the greens in rough strips. On a medium flame, heat some oil in a pot and add your onion. When the onions have softened a bit, add the greens and stir. Season with salt and mix. Cover for 3-5 minutes and remove from heat before the greens overcook. (If they are, they will take on a darker, deeper green colouring). Oh, the business is about catering. I’m trying to cater mainly for parties and various functions. My main focus has been almost all types of food, ranging from local foods such as pilau, chapati, rice, githeri; local snacks like mahambris, kaimatis, mutais and so on. We bought washed sukuma wiki. So, usually you buy it in batches and then it’s washed and cut into small pieces. So, after that, we put some oil and fry some onions – just lightly. 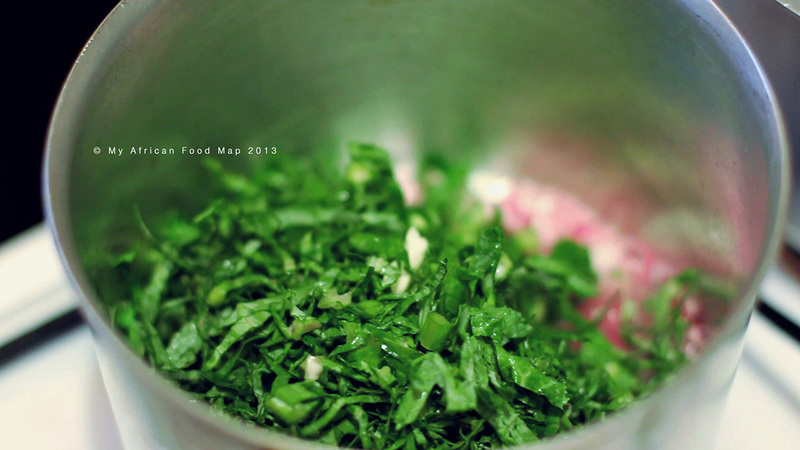 Then you add some sukuma wiki onto the onions. And add a bit of salt, and then you still mix. You go ahead and mix. You can see it’s still green. So, we cover it just for a few minutes. Most people actually overcook sukuma wiki. So it kind of turns the colour and it becomes something totally different because of over-cooking.